Though the home Wi-fi segment in India is a small one, it is growing at an unprecedented rate. That is, if one chooses to call a Rs 35,000-40,000 crore market (as per various industry estimates) ‘small’. Keen to tap the huge opportunity window, Sistema Shyam Teleservices (SSTL), which operates under the brand name of MTS, has announced its entry into this segment. Obviously the telecom operator is hoping to see its revenues from data usage soar. With more and more users across the country using Wi-fi networks to connect their computers and other smart gadgets to the internet both at offices and at homes, the Russian conglomerate Sistema controlled SSTL is now focusing on the home Wi-fi segment. 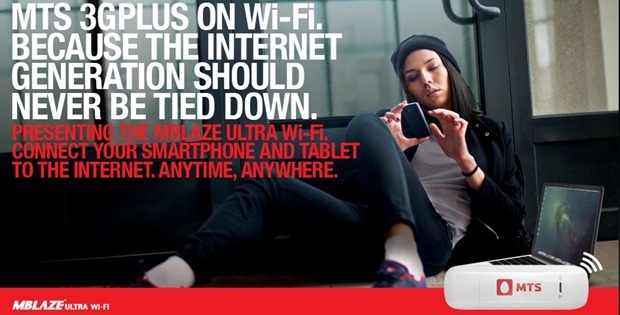 With the launch of their new product, Homespot Instant Wi-Fi which comes with an MBlaze Ultra dongle, the company is now planning to get to internet users in the 16-35 age group, focusing primarily on smaller families in Tier 2 and Tier 3 cities. The simple plug and play mechanism will allow broadband access to five users simultaneously including smartphone users. The pre-paid users will need to pay Rs.1,299 for the device with which they will get 10 GB of bundled data while the post-paid users will need to pay a relatively lesser Rs. 999 for the device. Monthly tariff plans start at Rs.248 for pre-paid users and Rs.550 for post-paid users, going up to Rs.999. Prepaid users opting for the Rs 499 per month plan will get 5GB of data including free WhatsApp and Viber. Not only are both of these among the most widely used mobile applications, but also ‘eat’ up the data package of users. Offering these services for free will undoubtedly add to the appeal of MTS data package. Five users being able to use the pack at the same time also means that users can cut their monthly data usage bills into half, assuming a family of four each of whom use 1 GB data every month on multiple devices. As per the latest figures released by the Telecom Regulatory Authority of India (TRAI), there were 85.74 million broadband subscribers at the end of December 2014, an increase over the 82.22 million subscribers at the end of November, 2014. That shows a very healthy monthly growth rate of 4.28 per cent. However, the number of fixed wireless subscribers, which include Wi-Fi, Wi-Max, point-to-point radio and VSAT, remained flat at 0.43 million during the same period. “With the Homespot Instant Wi-Fi solution, we have a fantastic product to address the internet needs of multiple users including Smartphone customers at home with a single, easy to use device. The launch of Homespot Instant Wi-fi solution is being supported by integrated communication campaign featuring a TVC that will see the return of MTS Internet Baby in an all new avatar. The launch of this campaign will coincide with the upcoming cricket world cup,” said Leonid Musatov. Indeed, with the Cricket Word Cup 2015 being round the corner, the data usage is expected to increase manifold since the game is like a religion to frenzied followers across the country. At the same time, one cannot but ignore the fact that the leading telcos are not leaving any stone unturned to lure more and more people into their fold. The war getting more heated up than ever before means that inspite of affordable home Wi-fi solutions promised by MTS, it is not going to be cake walk.